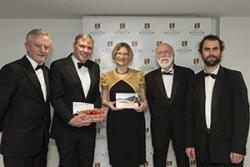 L-r: Professor Charles Sheppard, (Warwick University) Ronan Roche, Dr John Turner, Anne Sheppard & Prof John G Hughes.Projects which have benefited local and global communities were rewarded as Bangor University held its third annual Impact and Innovation Awards on the 3rd December 2015. 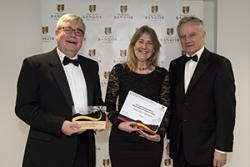 These prestigious awards at Bangor University recognise and celebrate the impact that the University’s research, innovation and enterprise activities have on the wider economy and society. 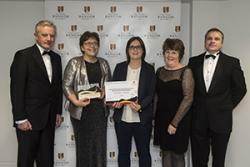 This year, the University has introduced a new award category, Outstanding Contribution to Wales, to recognise activities that have led to impact of national significance in Wales. A project which provides the knowledge base which informs the UK Government and other bodies in their management of the World’s largest marine reserve, won the University’s award for Best Impact on Public Policy and / or Public Services sponsored by the ESRC Impact Acceleration Account. Covering an area the size of France surrounding the Chagos Islands in the Indian Ocean, Chagos Marine Reserve has near pristine waters and undamaged coral reefs which serve as a global reference site, providing a benchmark for reversing damaged ecosystems elsewhere. It also serves as a refuge for species that reseed degraded parts of an ocean on which millions of people depend. Dr John Turner of the School of Ocean Sciences co-leads the work with University of Warwick and the Zoological Society of London, assisted by an international team. During their research expeditions to this remote region, they have the rare opportunity to assess a naturally functioning ecosystem in the absence of human impact, to understand how resilient ecosystems are capable of responding to climate change. The team also work with Chagossian communities now living in the UK and Mauritius to involve them in conservation, and raise awareness of the importance of very large marine reserves in protecting ocean wealth for future generations. With the Vice-Chancellor (left) are Simon Crawford, Burpee Europe; Dr Katherine Steele, David Shaw of the Sárvári Research Trust and James Stroud.Ten thousand amateur gardeners across the UK were able to grow a new strain of early ripening and tasty tomato suitable for growing outdoors in the UK, thanks to a Bangor University project working with associated businesses. 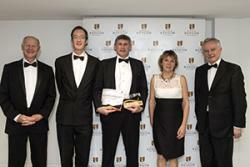 Dr Katherine Steele and James Stroud, of the University’s School of Environment, Natural Resources & Geography won the Siemens Healthcare Diagnostics Products Ltd sponsored Award for Best Business Innovation. The new blight-free Crimson Crush tomato, is now sold by a major seed distributor. The project was developed as a KESS Research Scholarship between the School, the Sárvári Research Trust and Burpee Europe. It combined a method which selects the genetic markers for beneficial traits in the plants, which speeds up the breeding process, with field trials. In the UK 36,000 plants were sold in 2015 and 1.2 million seeds sold for the 2016 season. It is expected that sales will reach between 3 and 4 million seeds per annum as production is increased to meet with demand, enabling amateur growers to grow tomatoes without the need to use fungicides on their crops. The award for the Best Cultural and Societal Impact was awarded to Dr Einir Young and Gwenan Griffith of the Sustainability Lab at Bangor University. Following an approach for support, the Sustainability Lab partnered with seven heritage sites on the Llŷn Peninsula in April 2014 to establish the first ever Dr Einir Young and Gwenan Griffith of the Sustainability Lab and #Ecoamgueddfa partners, Meinir Pierce Jones and Arwel Jones with the Vice-Chancellor.ecomuseum in Wales and the first ecomuseum in the world to be fully digital by default. The main aim was to drive tourism business in the region during the shoulder season with a conservative estimate of increased revenue of £2million to the economy through cultural tourism. In order to achieve this the partners in the #Ecoamgueddfa identified a need for co-ordinating and co-marketing the ‘offer’ to visitors to Pen Llŷn. A digital marketing package has been developed on social media platforms, with apps and websites developed for the Welsh and European markets. In the relatively short time since establishing the initiative the global audience for communications from the #Ecoamgueddfa has reached upwards of 150,000. Some of the oldest surviving Welsh language poetry has been brought into the 21st century with new multi- media teaching resources for students studying A-Level Welsh (first language). Professor Peredur Lynch of the School of Welsh led the project for WJEC to develop the new course materials for the new GCE AS / A level qualifications to be taught in Wales from 2015 onwards. The new materials will enrich the experience of teaching and learning about the early Welsh poetry of Aneurin, Taliesin and Dafydd ap Gwilym. For this he received the Professor Peredur Lynch and Mari Watkin of WJEC/CBAC receive their award from Professor John G Hughes.Outstanding Contribution to Wales Award. The Welsh Government funded project for the WJEC, enabled Prof Lynch to combine over thirty years of his own research and teaching on the subject, and that of other scholars, in order to present this part of the curriculum in an innovative and exciting manner to teachers and students, with online multi-media tools to offer new perspectives on early Welsh literature. Available since early 2014, the online resources are accessed online by teachers and lecturers and indeed, anyone who has a love of or interest in early Welsh poetry. They now form the main source of information for anyone studying the Gododdin or preparing students for the A-Level syllabus.